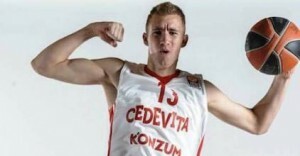 Dzanan Musa has already taken his first step, making his Euroleague debut with Cedevita Zagreb. Looking at the starting lineup for Cedevita Zagreb’s 2015-16 Euroleague season opener, it was next to impossible not to do a double take. It was no surprise that 19-year-old center Marko Arapovic was starting against Olympiacos Piraeus. But the starting shooting guard cannot be right – Dzanan Musa. They are starting Dzanan Musa? For those who don’t know who Dzanan Musa is, he is the star talent that led Bosnia and Herzegovina to the 2015 U16 European Championship title as MVP. Yes, U16 Euros. And now he’s starting in the first game of the Euroleague season – lining up against multiple Euroleague champion Vasilis Spanoulis. “He started because coach (Veljko Mrsic) wanted to put him in the beginning on Spanoulis. He wanted to see energy from him and wanted to show him that the club is behind him,” Cedevita sports director Matej Mamic told heinnews. Musa played 4:55 minutes, scoring four points as he made his only field goal attempt and hit both of his free throws. Musa grabbed one offensive rebound, turned the ball over once and committed two personal fouls – for a PIR of 3. Mrsic did not put Musa back into the game after playing nearly the first five minutes. But that was enough for Musa to have made his Euroleague debut – at 16 years, 5 months and 7 days. According to Pablo Campoy with the Euroleague, Musa is the ninth-youngest player to make their debut in Europe’s elite competition. Younger were only Aleksandar Ugrinoski (Cibona – 15 years 8 months 22 days), Can Maxim Mutaf (Fenerbahce – 15 years 10 months 14 days), Manuchar Markoishvili (Benetton Treviso – 15 years 10 months 23 days), Gina Cuccarolo (Benetton Treviso – 16 years 0 months 0 days), Ricky Rubio (DKV Joventut – 16 years 0 months 3 days), Uros Tripkovic (Partizan – 16 years 0 months 28 days) Damir Markota (Cibona – 16 years 1 month 11 days) and Ioannis Karamalegos (Panathinaikos – 16 years 1 month 23 days). “I’m happy and he deserves that for what he did this summer,” said Matic of Musa, who helped Bosnia and Herzegovina qualify for the 2016 FIBA World Championship – the first time the Bosnians had ever booked a spot in a global FIBA event. Matic said the Bihac native came back to Cedevita full of confidence after the U16 European crown, which actually followed him leading the Bosnians to the 2015 European Youth Olympic Festival title in Tblisi, Georgia with a win over Spain in the final. “He has more confidence, a little bit better shot and a better understanding of using his minutes on the floor,” Mamic said. Musa still is a very slender youngster, who turned down offers from Olympiacos and Partizan before signing a long term deal with the Croatian club Cedevita late in 2014. He was sent on loan for the second half of the season to Zabok. But this season, Musa is with the Cedevita senior team. “Expectations for him are to play good defense every game – he must improve a lot for the senior team; to be offensively active; and get some experience,” said Mamic of Musa, who left the small Bosnian club Kos Moster for Cedevita. In addition to his one Euroleague appearance, Musa also has appeared in three Adriatic Leugue games, playing 12 combined minutes and collecting three points on 0-4 shooting, 3-of-4 from the foul line, 2 rebounds and one steal while committing three fouls. Musa made his Euroleague debut on October 15, 2015. Also making their Euroleague debuts on that day were two other star prospects, who were only slightly older than Musa. France U18 international Frank Ntilikina played for Strasbourg against Crvena Zvezda at age 17 years 2 months 17 days. Dragan Bender meanwhile played his first Euroleague game for Maccabi Fox Tel Aviv against CSKA Moscow at the age of 17 years 10 months 28 days. A day later – on October 16, 2015 – Slovenian star talent Luka Doncic became the 21st player in Euroleague history (according to heinnews research dating back to the 2000-01 season) to debut under the age of 17. The Real Madrid guard was 16 years 7 months 18 days when he played against Khimki Moscow Region. There are two other players with decent chances of making their Euroleague debut before age 17, with them being Real Madrid’s Serbian Dino Radoncic, who would be 16 years 9 months 14 days if he plays on October 22, 2015 vs Czvena Zvezda; and Panathinaikos’ Georgios Kalaitzakis, who would be 16 years 9 months 20 days should he play on October 22, 2015 vs Karsiyaka.